Field Crew member, James Taylor (left), in action removing the cabinet set, which is then loaded on the truck (right). The RE Store relies on a dedicated team to keep things running smoothly. If you’re a regular at our Bellingham or Seattle stores, you might even know a few us by name. What you might not know, however, is that we have a whole cast of characters salvaging materials out in the field. In fact, the RE Store offers a range of field services, including: full salvage and strip-out, large item pickup, and green demolition (aka deconstruction). Without our hardworking field crews, we wouldn’t be able to recycle the volume and range of materials that we do. 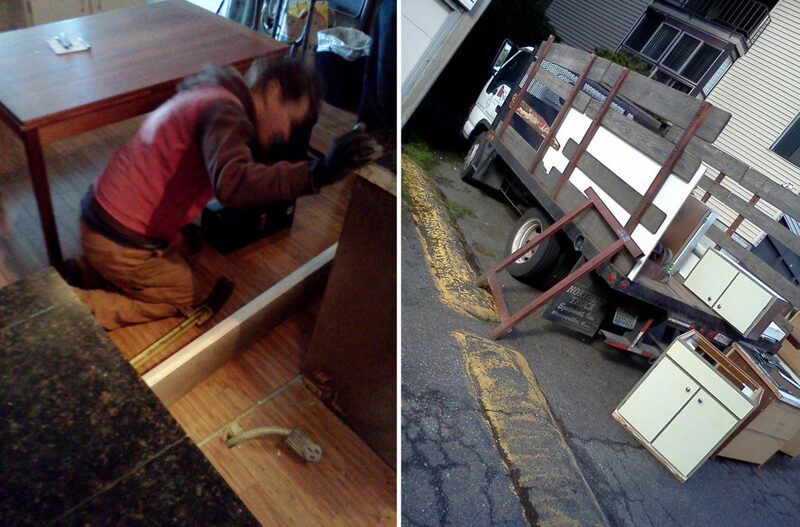 The Seattle field crew salvages a lot of kitchens, and this week was no exception as we arrived at a condo in Magnolia to pull some cabinets. The homeowners were remodeling, which is a typical scenario for us. Not so typically, the marble tiled counter tops started falling off, tile by tile, as we tried to carry them to our truck. While it did make the cabinets lighter, we typically try to not break things. After a few minutes of picking up marble tidbits from the parking lot, we were on our way with a nice set of cabinets. The homeowners saved money on their remodel and they kept reusable materials out of the waste stream. I wouldn’t be surprised if someone is laying a new counter top on those cabinets right now; or at least they’re trying desperately to match the remaining tile. P.S., the RE Store has a great selection of tile. But seriously, salvage is a win-win situation for all involved, and we’re happy to do our part—even when a few pieces fall off.